Time for another LH quiz! I’ve run into a couple of people who say /tɜrˈmɛrɪk/ (“tur-MARE-ik”), with penultimate stress, something not recorded in any of my dictionaries, which have only initial stress — cf. American Heritage, which gives /ˈtɜrmɜrɪk, ˈtuːmɜrɪk/. I’m curious whether this is idiosyncratic or a sign of an alternate pronunciation on the rise, so I put it to the Varied Reader: do you say this word with penultimate stress, or know someone who does? Incidentally, the etymology is interesting; it’s from Middle English termeryte, derived from French terre mérite and/or New Latin terra merita, ‘turmeric’ (literally ‘merited earth’). TUR-mer-ik here and have never heard it any other way – grew up in Indiana/Kentucky, have lived for extended periods of time in Kansas City and Denver as well. Token non-native speaker here: never heard of the word before, both pronunciations sound natural enough when I’m trying to sound it out in my head (but my first attempt was penultimate stress, rhyming with “Homeric”), and what does it mean anyway? EDIT: aah, it means a kind of exotic plant. That explains the initial stress – I thought it was an adjective! Never heard of it before either way. EDIT 2: oh, it’s curcuma! I know what curcuma is (it’s a pretty common spice), I just had no idea that in English it was called differently. I say /ˈtɜrmərɪk/ and have never noticed /tɜrˈmɛrɪk/ . My mammy says /ˈtjuːmɜrɪk/. From the etymology it looks like a misspelling pronunciation, but Merriam-Webster lists a variant spelling “tumeric”. Are there people who say /ˈt(j)ʊɹmərick/ ? 32 year old, from Boston originally. I would say tur-MER-ic, but I am no cook. Asked a similar aged Canadian who knows her way around the kitchen – also tur-MER-ic. I wouldn’t be surprised to hear the first syllable stress, but this sounds much more natural to me on the second. It’s not part of my active vocabulary, since I don’t cook much. Either pronunciation sounds natural to me. I’d guess the pronunciation with penult stress is due to analogy with adjectives ending in -ic, which are generally stressed on the penult. I could understand how people who’d never heard it spoken might guess that it goes like Homeric, America, barbaric, atmospheric, etc. Or ‘meritorious’, according to one historical dictionary. Nobody has an explanation on offer. Is turmeric deserving, is it deserved by the discerning ? I had never heard the penultimate stress. I do know people who say it without the first r and with a longer U. But I’m not really astonished that this variation exists, because of an experience with another kitchen herb. When I first heard my daughter-in-law pronounce marjoram as maJORum I thought it was her own idiosyncrasy and probably derived from reading it before hearing it said, or from her parents’ speech (not native English speakers). Then I found that a lot of people say it that way. edit: I would say that it means “meritorious,” because turmeric is an earthy-tasting, bright ochre colored root which has a long-established reputation for being outrageously good for the health. Another spice with variable stress is oregano, though the variation for it may be more transatlantic. I always pronounced it “TURmeric”, until about a year ago, when I heard the pronunciation “turMERic” uttered so naturally and confidently that I instantly concluded I must have been pronouncing it wrong my whole life. I guess I can now go back to saying “TURmeric”. I wonder if the “majorum” speaker’s parents had a language where that /r/ was not present. It’s not in the botanical Latin, and it wasn’t in the old French, so English might be the oddball. Well, there isn’t an /r/ in the first syllable in Czech (majoránka), but the accented syllable is still not the one with the O in it. Since she grew up in western Canada, I think that the pronunciation is probably from there. Gurkemeje has penultimate stress. Merian initial. Native American and I say “TUːmɜrɪk”. It wouldn’t cross my mind to pronounce the “r” in the first syllable and have never heard it pronounced that way or with penultimate stress. But I also don’t cook much, nor do I spend much time discussing cooking. I also say o-RE-gano. Penultimate stress strikes me as British. Well, there isn’t an /r/ in the first syllable in Czech (majoránka), but the accented syllable is still not the one with the O in it. It can’t be; Czech mercilessly stresses every word on the first syllable. This process would render Oregano as */ˌo.rɛ.ˈgaː.nɔ/. It doesn’t, because we learn this word as an exception (apparently shifting the stress after applying the regular process: the outcome is /ɔ.ˈrɛ.ga.nɔ/ with an irregularly short stressed syllable); I think it’s already an exception in the original Italian. Is this the same dissimilation as in Feb’uary and lib’ary? UK: I’ve always heard the first syllable stressed. I didn’t, so it seems I pronounced it wrong all my life. Duden confirms that it’s stressed on the re, but on the few occasions I heard it pronounced, people stressed the ga, where the uninitiatied German speaker would expect the stress to be. I grew up hearing it both ways. I think most people had never heard it any official way, and only saw it in a cookbook, so they just guessed. Once the television cooking channels became popular, most people started saying it with initial stress. I noticed this with a few other ingredients, but I can’t recall them all at the moment. Quinoa and cacao for sure (I worked at a small natural market after high school). I say /ˈt͡ʃʉmɘrɪk/. I’ve also heard /ˈtɜmɘrɪk/. The feel like the last syllable could be /rɘk/ although I’m not sure it’s quite reduced that much. My idiolect preserves both “r”s in library. When I was growing up dropping the initial r was heavily stigmatized as childish and teachers and parents would correct older children who did drop it. I say /tʌʳˈmɛɹɪk/, but that’s a spelling pronunciation, I only came across the word as a translation of زردچوبه. Will adopt initial stress post-haste! I’m glad I asked; clearly there’s a significant minority who use penultimate stress, and the lexicographers just haven’t caught up yet. Paging M-W and AHD! Well, I seem to recall (and hope to be corrected if I’m wrong) that John Cowan has argued that stress in English is penultimate by default. On the other hand, a put-upon-seeming linguistics professor at a small university once advised me that English has default initial stress. So, perhaps the informants here are simply partisans of or the other faction. I know /ˈtjuːmɜrɪk/-sayers but no /tɜrˈmɛrɪk/-sayers, or at least none who have outed themselves. On the subject of spices, I’ve known some /ˈkʌmᵻn/-ers as well – I’ve always said /ˈkjuːmᵻn/. (Wikipedia informs that the former is British, though my acquaintances are American.) I say /ˈkɑːrdəmɑm/ but /ˈkɑːrdəməm/ seems much more common, and I have an Aussie friend who pronounces it with a schwa in the last syllable, but a final n.
I’m a /ˈkʌmᵻn/-er myself, but my wife says /ˈkjuːmᵻn/. I’ve usually heard and used TUR-mer-ick, as that’s what my grandmothers and all the older women in the church kitchen said. Tur MER ic. Greater NYC metropolitan area, middle aged. So does my wife. I’ve no clue why. I think I have heard first syllable stress, no clue when or where. Our respective families did not use it while we were growing up. We, on the other hand…. For the fish, that is. Only ever said (and heard) /ˈtɜrmərɪk/ . My wife’s family has an Indian background, so we say the word quite a lot. I’ve never heard it pronounced with the stress on the second syllable, but now that I know the derivation, I’m going to start saying it that way! Except, she mutters bitterly, for when it doesn’t. Czech seems to me to be more regular than many languages but it doesn’t cut the casual learner any slack on any front, including this one. I rarely speak or hear this word, but would stress the second syllable. I asked my very culinary wife how she pronounces it, and she first said TUR-mer-ic, and than said, “Or TYOO-mer-ic.” So check all the boxes on the form, I guess. Some of these pronunciations come from restaurants, where cooks find themselves using ingredients they didn’t grow up with and assume that a counter-intuitive quasi-foreign pronunciation must be correct. AnEEce, COOmin, shallOTT and legOOm in particular smell like hypercorrection. Guy Fieri of the TV show “Diners, Drive-Ins and Dives” is clearly aware of the correct pronunciations but he makes a smug and knowing point of using the non-standard ones current in restaurants, while he pedantically flaps the r in his last name. This bothers me so much that I actually stopped watching the show. I say CULLinary, CUMmin, and licorish myself, and they are all standard US pronunciations — check your dictionary! AnEEce, COOmin, shallOTT and legOOm in particular smell like hypercorrection. Obviously shallot has final stress (unusually for BrE), like forgot. The folk process that led to my own recitation version has reversed the two half-lines: “some chopped shallot, which he never forgot”. I have also heard CULLinary in England, despite the fact that the OED lists CUlinary first, but it just makes me bridle and I will not have it — only word in which u in an accented open syllable gets pronounced uh. We don’t say cuppola for cupola or cubbicle for either cubicle or cubical. “And licorish for licorice is as nearly universal as groshery”. Is that /ˈgroʊʃərɨ/ or /ˈgrɒʃərɨ/ ? I don’t believe I’ve never heard either, though I often ate lickrish as a child. For me grocery may have /ʃ/ or /s/, but it’s a disyllable either way. I haven’t heard of any pronunciations with /ɒ/. Apparently, some people have /ʃ/ not only in grocery, but also in nursery and anniversary. (But it’s much less common for the latter two words). Information from Harvard Dialect Survey results. I say grocery, nursery and anniversary all with /səɹi/. (I think we’ve discussed this before.) The /ʃ/ forms aren’t very common here, probably owing to the high rate of non-rhoticity. And even nationally, ‘groshery’ is only used by about half of the population – not at all like licorice, in which /ʃ/ really is universal. For culinary and cumin, I have /ʌ/ like Hat. The former case is inconsistent with how Latin u tends to be treated in English, though it is consistent with how the other Latin vowels are treated. I also have /æ/ in basil, even though /eɪ/ may be more common in the US. I used to have /æ/ in basil, but I’ve changed to /eɪ/ under the influence of my wife. First syllable stress only, hearing and (obviously then) speaking. Later I came across the spelling turmeric; now my pronunciation varies rather randomly, but always stress on first syllable. None of those British dictionaries that attempt to cover US English (onelook and LPD) records [ʃ] in “grocery” (in US or UK English). Are MW and AHD generally more diligent in covering less-common/more-deprecated pronunciations, or is US groshery just a UK blind spot (deaf spot)? Probably a little of each. I wouldn’t put too much stock in American pronunciations listed in British dictionaries – I’ve seen too many cases where they’ve clearly failed to check for differences. For example, Cambridge’s online dictionary and Oxford’s online learner’s dictionary both have Americans saying supreme with a full vowel in the first syllable. I’m more surprised at Longman. John Wells is relatively good for nonstandard and US, but I guess not for nonstandard US. For example, Cambridge’s online dictionary and Oxford’s online learner’s dictionary both have Americans saying supreme with a full vowel in the first syllable. I am an American, and the full vowel seems correct to me, especially in combinations like “supreme leader”. AHD5 lists only the FOOT vowel; MW gives a choice of FOOT or schwa. Both are reduced vowels relative to BrE GOOSE, but one is more reduced than the other. True; I guess I generally use the FOOT vowel. I (UK) have always heard and said it with the accent on the first syllable. Another problematic culinary word is “baklava”. My instinct would have been to put the accent on the second syllable until I heard the proprietor of a Greek food stall say BAKlava. I say that one as [ˈbɑːkləˌvɑː]. 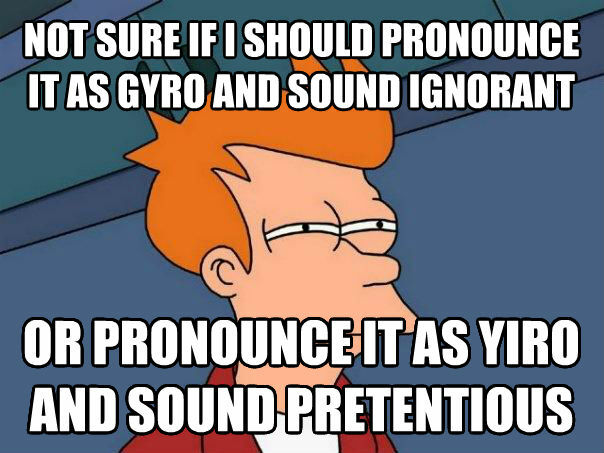 A word that I’m still unsure about is gyro; one online dictionary attests [ˈdʒɪɚoʊ], which might be a decent compromise pronunciation. We talked about gyros and their pronunciation back in 2007. Never mind “supreme leader”, what about the Supreme Court? Or about Vermin Supreme, the presidential candidate? The official stress is on the third syllable; you can hear it around the nine-second mark in this video (stick with it for mouth-watering trays of the stuff). But conversationally it often gets retracted to the first syllable, as at the ten-second mark of this one. You will never hear it on the second syllable. Turkish has default final stress, says WP, except “forms including suffixes with inherent stress [or lack of it], adverbs, proper names, and some loanwords (particularly from Italian and Greek)” Proper names (including loanword names) in particular follow a different stress pattern: on the antepenult if it is heavy and the penult is light, and otherwise on the penult. This stress, called Sezer stress after its discoverer, does not shift when suffixes are added. How do you say brusque? Oh, /brʌsk/. I see some people also say /bruːsk/ or /brʊsk/. The situation with this word is a bit different from “culinary” and “truculent,” seeing as the “u” is in an orthographically closed syllable. Adana what you’re talking about. It’s called tur-MER-ic among herbalists in California. which only work if all three nouns have initial stress. i’ve never heard anyone say [tɚ’me.ɹɪk] (tur.MARE.ick) but i would definitely prefer hearing that to hearing TU.mur.ic. I have always pronounced it as “too MARE ic”. I am 55 and live in Pittsburgh, PA. I have lived in both TN and Boston, but don’t recall picking it up anywhere in particular. I do keep the first R silent.